Unlike most of the people who've previously walked through the gates of the West Virginia Penitentiary in Moundsville, you can be certain you'll be walking out again a few hours later. The imposing Gothic structure was first opened in 1876, but closed in 1995. It's seen riots, fires and the execution of nearly 100 prisoners through either hanging or electrocution. These days, the only things it sees are much better behaved visitors. You can take a tour of the grounds and see the rows of cramped 5 ft.-by-7 ft. cells during the day; for braver souls, the penitentiary also offers midnight tours, followed by the chance to kick around inside the prison on your own until 6 a.m.
Overlooking West Marietta/Harmar is the imposing ashlar sandstone Italian villa known as "The Anchorage" or "Putnam Villa". This home, built in 1859 by Douglas Putnam for his wife Eliza, comprises 22 rooms and a grand tall campanile that fronts the house. From the tower room, the largest part of Marietta and its two rivers can be viewed. John Slocomb was the architect and master builder. The walls are made of 24" thick sandstone quarried from the top of the hill behind the house. The foundation is of solid rock and all wood used in the house is locally grown oak. The Anchorage is best remembered as Edward MacTaggert's residence. Using wealth accumulated from oil wells in Oklahoma, Mr. MacTaggert restored the home and furnished it with treasures from his many worldwide travels. From the tower room, the largest part of Marietta and its two rivers can be viewed. This mansion served as the residence of many prominent Marietta citizens including Harry Knox (Knox Boatyard), Dorothy James Roberts (author), and Sophia Russell (Marietta College). The mansion is currently undergoing restoration sponsored by the Historical Society. Salem Cemetery is located on Salem Ridge Road (TR-343) in the Egypt Valley Wildlife Area outside Hendrysburg, Ohio (Kirkwood Township, Belmont County). 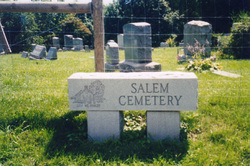 Salem Cemetery is also known as Salem Church and Salem Methodist Episcopal Cemetery. The Salem Methodist Episcopal Church was located across the road from the cemetery until it burned down in the 1960s. There are lots of old gravestones, and it is growing since it is still an active cemetery. It is extremely well taken care of by the Kirkwood Township Trustees. I had heard that this cemetery is very difficult to find since the roads aren't marked very well, but we had no trouble finding it at all. Salem Cemetery is supposedly haunted by the ghost of Louiza Catharine Fox, the first person murdered in Kirkwood Township. 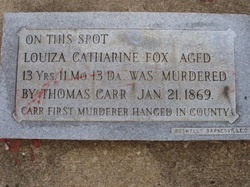 Louiza Fox was a thirteen-year-old girl who lived in the area with her family. She was dating a local coal miner, Thomas D. Carr. They met through a common employer, Alex Hunter. Thomas worked at the coal mine Mr. Hunter owned, and Louiza worked as a servant in Mr. Hunter's home. Thomas was madly in love with Louiza and planned to marry her. Louiza's parents were fine with this plan until they started to hear stories about Thomas's violent mood swings and actions. Also, they weren't sure they approved of the large age difference. Thomas Carr was furious when he heard that Louiza and her parents wanted to end their engagement. On January 21, 1869 he waited behind a fence on the road Louiza took home from work every night. He finally saw her walking down the road with Willy, her little brother. Thomas sent Willy home so he could talk to Louiza. They didn't do much talking though. He kissed her, then slit her throat with a razor and stabbed her fourteen times. He threw her body in a nearby ditch and hid at a local bank. Louiza's little brother saw Thomas Carr kill his sister from a distance. He ran home and told his parents who got a search party together to find him. They found him the next morning badly wounded...he had tried to kill himself by slitting his throat and shooting himself. His attempt was worthless though, he was arrested and his wounds were treated. 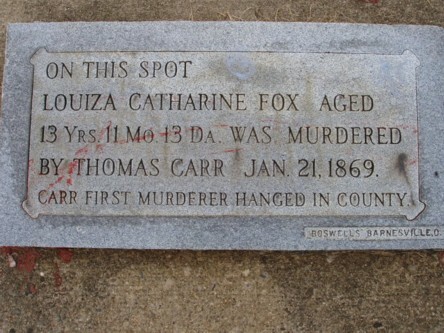 Thomas Carr was sentenced to death five days later by Judge Way. He laughed when his sentence was read, and it was reported that he said that he did "not care a damn if it was to be tomorrow." On March 8, 1870, Thomas Carr made a full confession to Louiza's murder, and he also admitted to killing fourteen other people. He also said he attempted to murder at least five more. Many thought this was a lie though since he was known to exaggerate. On March 24, 1870, Thomas D. Carr was the first person legally hanged in Belmont County, Ohio. 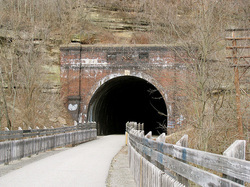 This railroad tunnel and viaduct was completed in 1857 to connect Wheeling with Washington, PA. It was rebuilt in 1904-05. The tunnel is about 470 feet long. It is now a Rails to Trails recreation trail. The quickest way to reach it is to park at a small pull-off (at hiking sign) on Rock Point Road and hike about 0.5 mile west on the walking trail to the east entrance. There is an interpretive sign at the west end of the viaduct, which is just west of the tunnel. The Baltimore & Ohio railroad bought the Hempfield Railroad in 1861. 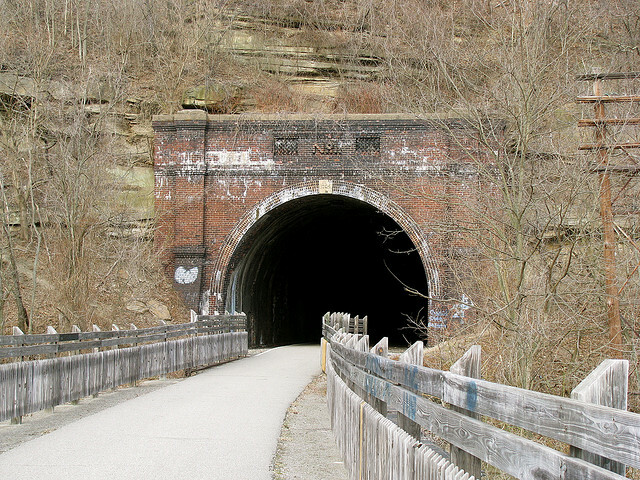 CSX bought the B & O and planned to demolish the tunnel in the late 1980s, but the City of Wheeling was able to acquire the right-of-way and converted the tracks and tunnel into a hiking trail. Until Nov. 1861, Camp Chase, named for Sec. 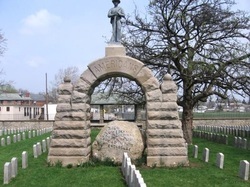 of the Treasury and former Ohio governor Salmon P. Chase, was a training camp for Union volunteers, housing a few political and military prisoners from Kentucky and western Virginia. Built on the western outskirts of Columbus, Ohio, the camp received its first large influx of captured Confederates from western campaigns, including enlisted men, officers, and a few of the latter's black servants. On oath of honor, Confederate officers were permitted to wander through Columbus, register in hotels, and receive gifts of money and food; a few attended sessions of the state senate. The public paid for camp tours, and Chase became a tourist attraction. Complaints over such lax discipline and the camp's state administration provoked investigation, and the situation changed. Food supplies of poor quality resulted in the commissary officer's dismissal from service. After an influx of captured officers from Island No. 10, officers' privileges were cut, then officers were transferred to the Johnson's Island prison on Lake Erie. The camp's state volunteers and the camp commander were found to have "scant acquaintance" with military practice and were transferred, the camp passing into Federal government control. Under the new administration, rules were tightened, visitors prohibited, and mail censored. Prisoners were allowed limited amounts of money to supplement supplies with purchases from approved vendors and sutlers, the latter further restricted when they were discovered to be smuggling liquor to the inmates. As the war wore on, conditions became worse. Shoddy barracks, low muddy ground, open latrines, above ground open cisterns, and a brief smallpox outbreak excited U.S. Sanitary Commission agents who were already demanding reform. Original facilities for 3,500-4,000 men were jammed with close to 7,000. Since parole strictures prohibited service against the Confederacy, many Federals had surrendered believing they would be paroled and sent home. Some parolees, assigned to guard duty at Federal prison camps, were bitter, and rumors increased of maltreatment of prisoners at Camp Chase and elsewhere. Before the end of hostilities, Union parolee guards were transferred to service in the Indian Wars, some sewage modifications were made, and prisoners were put to work improving barracks and facilities. Prisoner laborers also built larger, stronger fences for their own confinement, a questionable assignment under international law governing prisoners of war. Barracks rebuilt for 7,000 soon overflowed, and crowding and health conditions were never resolved. As many s 10,000 prisoners were reputedly confined there by the time of the Confederate surrender. 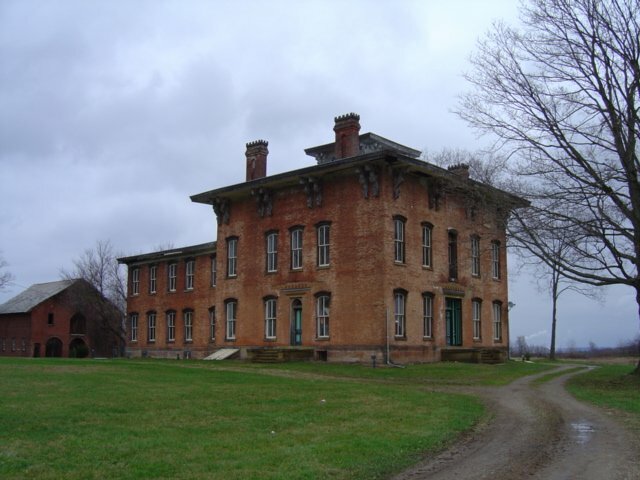 "Prospect Place" was the home of the George Willison Adams family of Dresden, Ohio, in the 19th & 20th centuries. This structure is listed on the National Register of Historic Places and is currently in the process of being restored. In the 1850s and 1860s the house was a station on the "Underground Railroad". 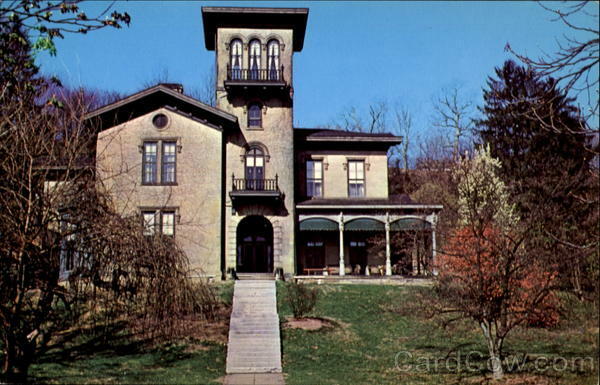 Although a few fine homes remain in Dresden from this era, Prospect Place is the last remaining Dresden area mansion (There were five: Prospect Place; River Dale; Mulberry Grove; Maple Hollow and Elm Grove), the others have met the fate of time and neglect and are no more. These were the homes of the "Lords of the Valley", men of great influence and wealth who helped tame a new land and create a community. We are restoring this home as a memorial to times gone by and to give the Dresden area back a piece of an ever-vanishing history. The house was purchased from the Longaberger Company of Newark, Ohio. We would like to express our gratitude and thanks for all of their help in obtaining this property and especially to Tami and Rachel Longaberger, also Bob Ziegler and his assistant Joyce. Special gratitude is expressed to the late Dave Longaberger who had a vision like ours for the house and who saved it by placing a new roof on the house in the late 1980s. The Bell Nursing Home in Kimbolton Ohio is a 14000 sq. ft. facility. The original house was built in the 1800s, two large additions have been added since. The building has served as a family home, funeral home, tannery, nursing home, and now offers paranormal tours. Many that have come to visit and many who have worked there in the past, have reported seeing, hearing, feeling, and smelling things that could not be rationally explained. Visitors have reported hearing a woman scream, hearing footsteps and voices, seeing misty and shadowy figures throughout the building, and much more. The owners have personally heard footsteps while no one else was in the building, seen lights turn on by themselves, heard doors slam, seen doors open, seen figures in the empty halls, and countless other unexplained occurrences.